The power of faith is the subject of this inspiring dramatic anthology series from the 1950s, showcasing true stories about men of the cloth and people in crisis. Priests, ministers and rabbis become deeply involved in the lives of individuals at the crossroads of life, where sin and salvation intersect. 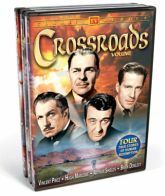 This 3-DVD 12 episode set features performances by Richard Denning, Vincent Price, Brian Donlevy, and Michael Landon, and Vincent Price. 9:30 Action: A young mother's shady past catches up with her when an ex-partner in crime returns from prison to recruit her for a new heist. Starring Richard Arlen and Susan Oliver. Last Strand: After an unsuccessful suicide leap from her hotel window, a hospitalized young actress is terrified of the upcoming Christmas holiday, sure that it heralds her death. Starring Conrad Nagel and Mala Powers. Lifeline: Working for the mob in an illegal casino doesn't trouble a woman's conscience until the syndicate bosses hire her naive younger sister. Starring Barbara Hale and Regis Toomey. Paratrooper Padre: A young boot-camp private makes a selfless sacrifice to save the life of the platoon's least favorite member - an angry loner with a troubled past. Starring Donald Woods and Charles McGraw. The Good Thief: Starring James Whitmore and Phillip Ahn. A U.S. Army chaplain is tortured by his Red Chinese captors when he refuses to stop ministering to his fellow prisoners of war. A Bell For O'Donnell: Starring Glenn Langan, Lyle Talbot and Edmond Lowe. A reverend learns a lesson in forgiveness when he is swindled by a fast-talking con man. Glenn Langan (The Amazing Colossal Man) costars with Lyle Talbot and Eve Miller. God's Healing: Starring Vincent Price and Frieda Inescort. Vincent Price stars as an Episcopal priest who works overtime to heal an old woman's embittered heart. Directed by Nathan Juran. Call For Help: Starring Richard Carlson, Michael Landon and Kenneth Tobey. A priest must re-evaluate his twenty years of work with troubled youths when a gang fight leads to a fatal shooting. Erle C. Kenton (Island of Lost Souls) directs this memorable episode featuring a young Michael Landon. The Cleanup: Reverend Russell's powerful sermons inspire the local citizens to take back their city from the forces of vice and corruption. Starring Vincent Price, Lloyd Corrigan and Sally Blane. Dig Or Die, Brother Hyde: In the harsh Dakota frontier, a preacher who is new to the region is sorely tested in his struggling ministry. Starring Hugh Marlow and Alan Hale, Jr. Mother O'Brien: A police detective is torn between family loyalty and professional duty when he learns that his drug-addicted younger brother is involved in a petty crime. Starring Arthur Shields, Donald Murphy and James Lydon. The Judge: In a lawless town, a young minister does double duty as a preacher and a judge. Starring Brian Donlevy and Donald Curtis.